Three weeks ago, BMW stock tumbled after the German auto giant slashed revenue, profit and EBIT margin guidance blaming "trade conflicts" which are "aggravating the market situation and feeding uncertainty" as well as "distorting demand more than anticipated and leading to pricing pressure in several automotive markets." Today, it was Daimler's turn. Echoing BMW, the Stuttgart-based maker of Mercedes warned 2018 EBIT would be "significantly" below prior-year levels, as a result of higher expected expenses in connection with "ongoing governmental proceedings and measures in various regions with regard to Mercedes-Benz diesel vehicles." The company also lowered Mercedes-Benz Vans unit sales due to delays in vehicle delivery, while also citing decreasing demand for Daimler Buses in some markets. Unlike BMW, Mercedes did not explicitly mention trade tensions in the guidance cut, however, in light of recent abysmal auto sales in Europe, today's warning is not going to help boost sentiment. 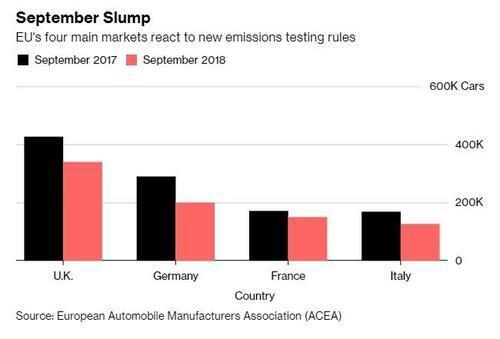 As we reported two days ago, Europe passenger car sales plunged 23% in September after new emissions test rules took hold, reversing August gains when automakers were hurrying vehicles out the door to beat the deadline. 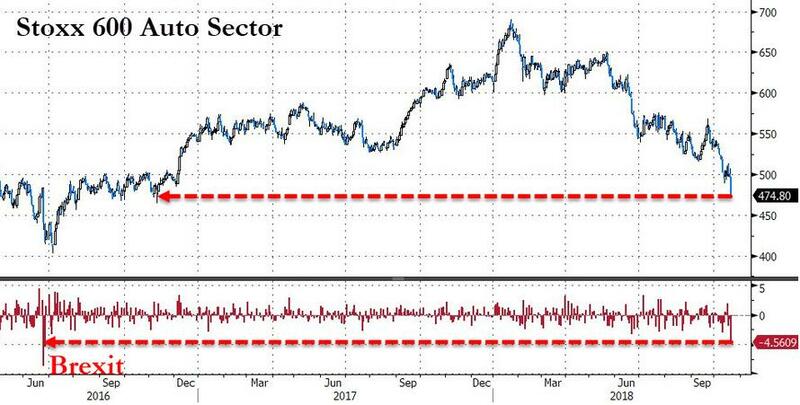 Additionally, as Bloomberg notes, the warning may foreshadow a tough earnings season for German stocks, and certainly for Mercedes whose stock plunged the most in 2 years on the announcement. Daimler's falling and European autos are now trading near session lows. Another reason to explain why European stocks are unloved. 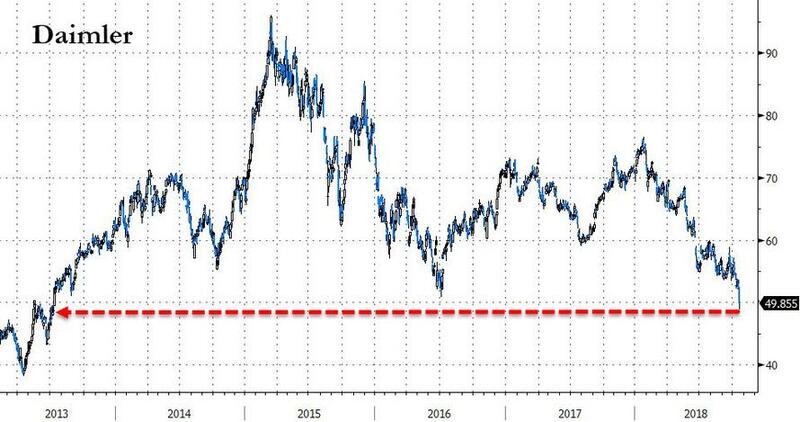 The weakness quickly spread to the European Stoxx 600 Automobiles & Parts index, which extended its previous declines, and tumbled as much as 4.8%, the steepest intraday drop since June 2016. 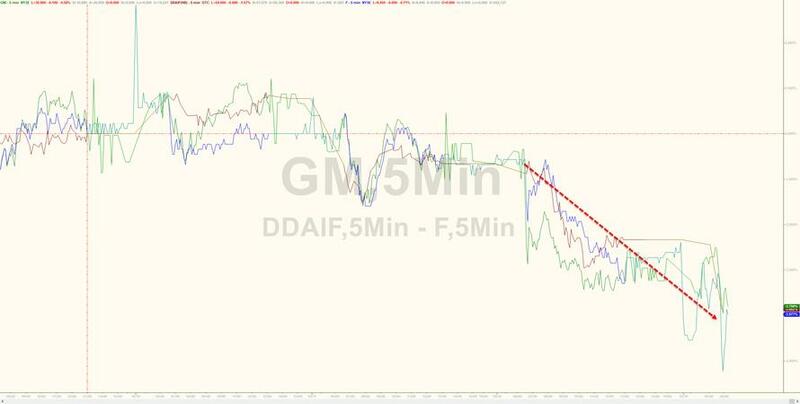 Finally, the weakness has spread to the US as well, with GM and Ford stocks also sliding in sympathy.